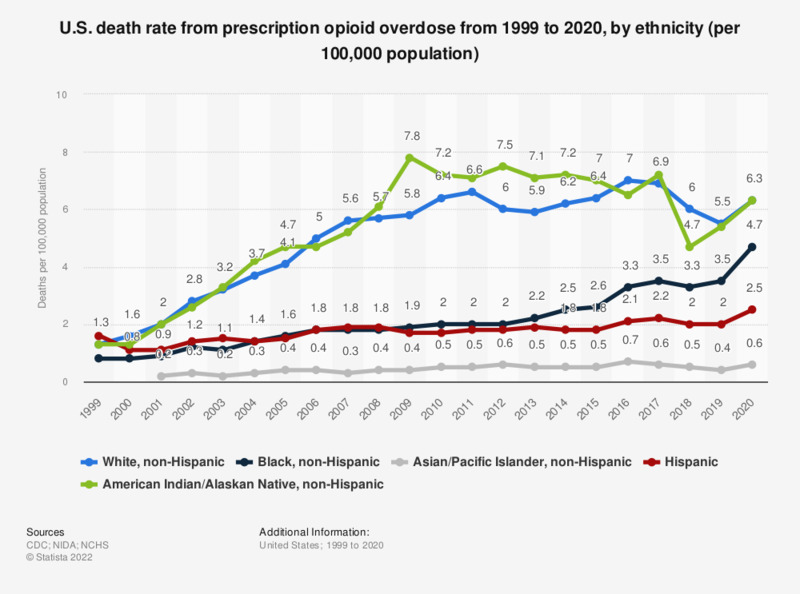 This statistic shows the annual death rate for prescription opioid overdose deaths in the United States in 2015 and 2016, by ethnicity. According to the data, in 2016 American Indians and Alaskan Natives had a death rate from prescription opioids of 6.5 per 100,000. Among this ethnicity, from 2015 to 2016, the death rate from prescription opioids dropped from 7 to 6.5. "Deaths are classified using the International Classification of Diseases, Tenth Revision (ICD-10). Drug overdose deaths are identified using underlying cause-of-death codes X40–X44, X60–X64, X85, and Y10–Y14. Rates are age-adjusted using the direct method and the 2000 U.S. standard population, except for age-specific crude rates. All rates are per 100,000 population."